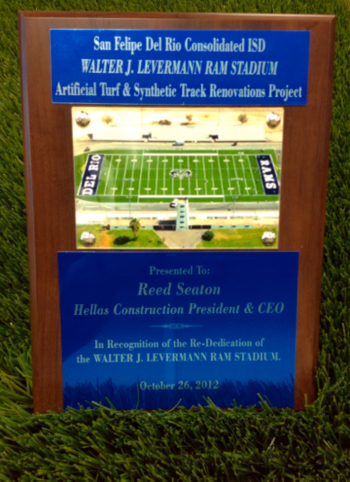 An engraved plaque returns with Hellas from Del Rio for the outstanding work completed at Walter J. Levermann Ram Stadium. Kurt Wofford, Hellas Construction’s Southwest Texas Business Development Manager was in attendance to accept the plaque. With him were his wife and children, and Tommy McDougal, Hellas’ Vice President and Chief Estimator. Hellas converted Del Rio High School’s existing grass field into a Matrix® Turf synthetic football field. Underneath the artificial turf, Hellas installed a CUSHDRAIN® elastic layer – a proprietary pad that enhances drainage, longevity of the field and shock absorption, leading to increased athlete safety. Hellas crews also installed an epiQ TRACKS™ S200 running track surface around the new field. Outside of the new track and field lies a Matrix Turf player development area further helping to maximize the use of the facility and breathe new life into Del Rio High School’s athletic and student activity programs. Hellas Sports Construction crews also re-surfaced the running track at Krueger Field – the athletic facility at Del Rio Middle School.